New items continue to arrive and we have upcoming classes/events! 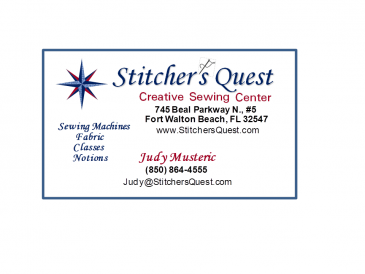 Store Hours are changing - Beginning next week, October 13, Stitcher's Quest will be open until 6 p.m. on Tuesdays and Saturdays until 4 p.m. The BERNINA 570 QE E - this Special Edition is an awesome machine for sewing, quilting, and embroidery! Embroidery Module and The Bernina Stitch Regulator are included. These special editions are limited, so it will be an amazing deal for one lucky buyer. We now have Imperial Batiste from Spechler-Vogel in white, pink, and powder blue. Sewing machine needles and quilt rulers - we have a wide selection that is competitively priced. Batting and stabilizer by the yard. 20% off all Fashion Sewing Cabinet custom orders through October 28 - arrival by December 24! Merry Christmas! BERNINA Super Saturday Sale! Saturday, October 17 --- 15% off up to $750 on all BERNINA machines priced at $1000 and above (excludes 570QE/570QEE). Bernette SEW PINK with travel bag is also 15% off on this day only - a Fantastic discount on an already Great Deal! The October Accessory Special is the BERNINA Braiding Foot #21 at 25% off!